Coll. No. 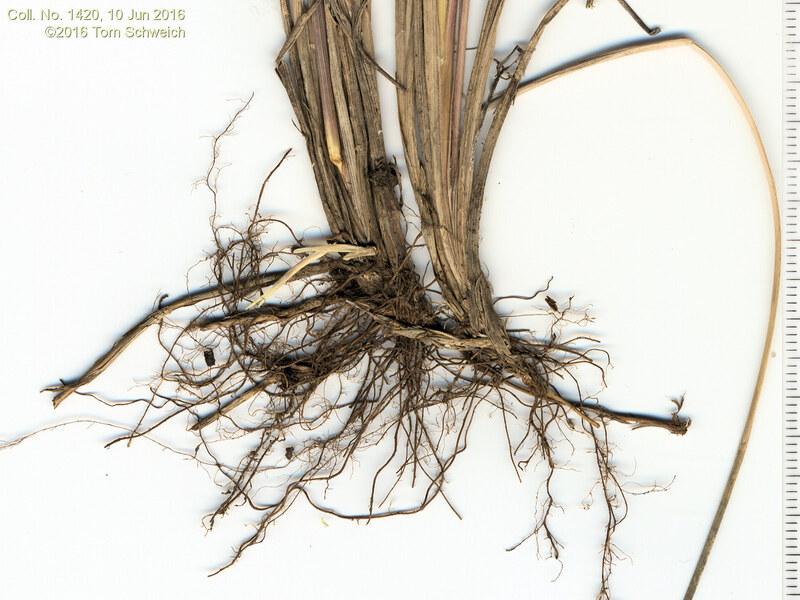 1420, 10 June 2016, characters observed: Perennial grass, rhizomatous (although of material collected for three vouchers, only one has rhizomes), not strongly flattened, to 75 cm. ; Sheath, open about ½; Ligule, membraneous, 0.7 mm. ; Auricles, 0; Inflorescence, much-branched open panicle, branches scabrous; Spikelets, one per node, 4 mm., awns 0; Florets, 3 per spikelet, reduced florets above fertile floret, #1 ♀, #2-3 ♂, Rachilla, extends 1 mm. above upper floret, not hairy; Glumes, #2, keeled, scabrous, lower, 2.0-2.3 mm., veins 1, upper, 2.5-3.0 mm., veins 3, prominent; Lemma, 3 mm., veins 5, keeled, tuft of hairs at base, >⅓ lemma; Palea, 2.3 mm., veins 2, green, otherwise translucent. Subspecies of P. pratensis are not recognized in Colorado (Weber&Wittmann 2012, Ackerman 2015). Field Notes: Coll. No. 1420, 10 Jun 2016. Other photos about Species - Poaceae or Poa pratensis.